At Vulcan, I get to work on a lot of very cool, but very confidential projects. But there are a a few projects I've been involved in that I'm able to share. I had the chance to redesign the website for the Seattle Art Fair for the 2018 show. We wanted a site that would showcase rich photography highlighting the art and the experience. 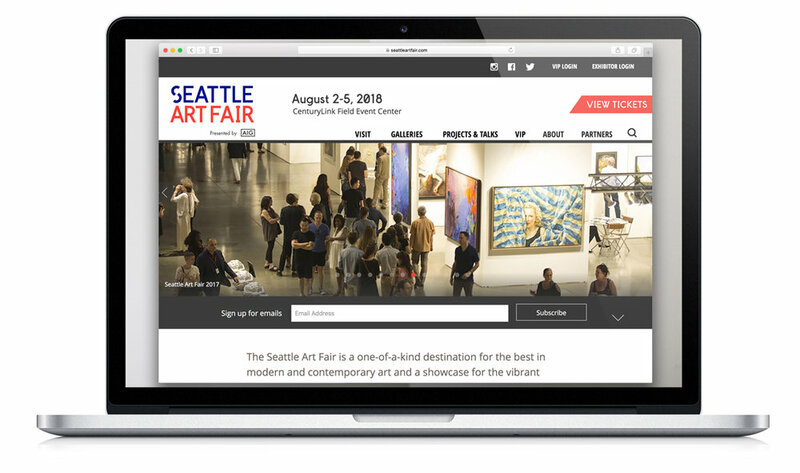 The site needed to align with the Seattle Art Fair brand, and appeal to both established collectors and those just beginning to explore the art world. The Skylight alerting platform was created to help governments and maritime enforcement protect their fisheries and local economies by alerting them to potential illegal fishing activity. I designed this web-based tool to be simple an intuitive, and to align with the design goal of a tool that would be at home in a control room or operations center. The Allen Coral Atlas is a tool that lets scientists and conservationists view the health of coral reefs around the globe. High resolution satellite imagery and mapped analysis are available as data layers. I was involved from early proof-of-concept sketches all the way through the finished design of the tool and the informational site. This is just the first stage of a multi-year project, and as we continue to map more of the world's coral reefs and build additional functionality, we'll stay in close touch with our users and get feedback to inform improvements and potential new features.